Built between 1399 and 1404, shortly before Timur’s death, the enormous Bibi-Khanym Mosque was once the largest mosque in the Islamic world. After years of decay, the building partially collapsed during an earthquake in 1897 and wasn’t rebuilt until the 1970s. While portions of the mosque have been completely restored, other parts remain in need of further restoration. This semi-ruined state takes nothing away from its architectural majesty. A giant parade portal leads into the courtyard with the main mosque straight ahead and two smaller mosques to either side. A huge Quran stand made from marble blocks sits at the center of the courtyard, and according to local legend, women who crawl beneath it will be blessed with many children. The interior of the mosque is currently being restored, with plans set to complete it by 2019. 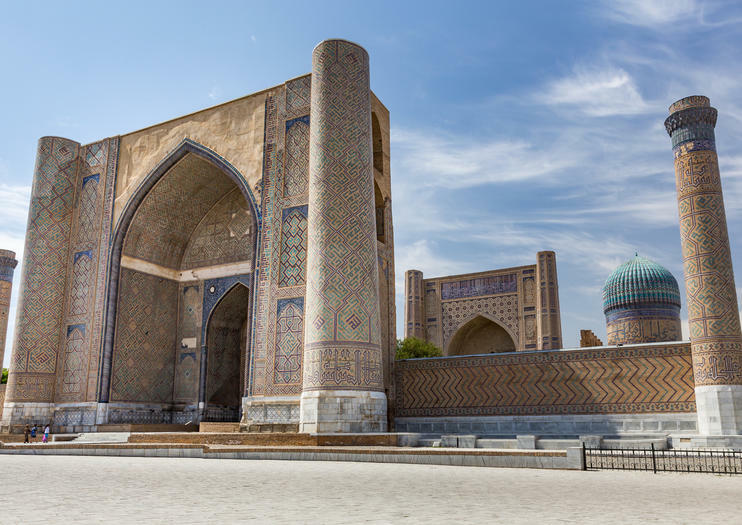 Explore the historical city of Samarkand with ease from Tashkent on this full-day tour. Depart from your Tashkent hotel and catch a high-speed train to Samarkand. In the company of your guide and driver, set out to see the city. Visit Gur-Emir Mausoleum, Registan Square, Bibi Khanum Mosque, Shah-i-Zinda necropolis, and Ulugbek Observatory. At the end of the day, return to Tashkent on the train.